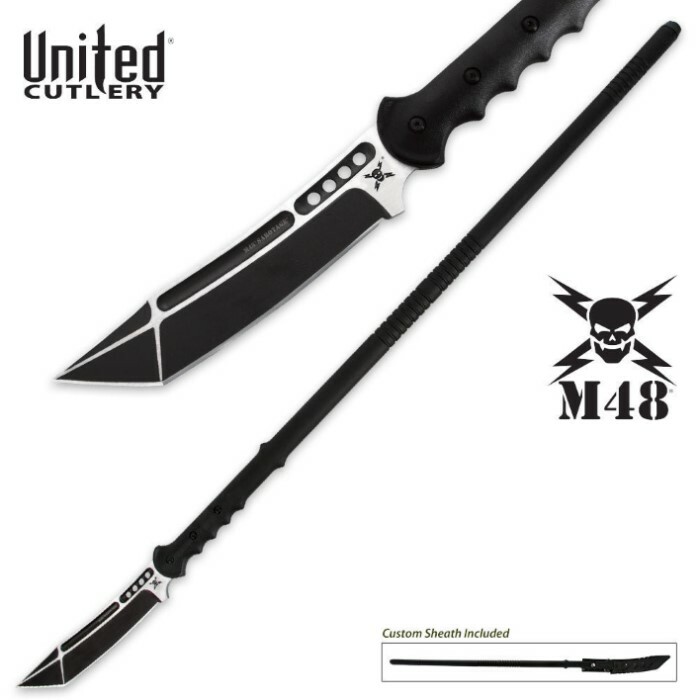 United Cutlery M48 Sabotage Tactical Survival Spear | BUDK.com - Knives & Swords At The Lowest Prices! M48 delivers once again with this all new M48 Sabotage Tactical Survival Spear! This unique hybrid design combines the popular M48 Sabotage tanto fighter knife with the long reach of a survival spear, bringing you a must-have new survival accessory. The spearhead features rock-solid 2Cr13 stainless steel construction with a 7-1/4" sharpened edge and a piercing tanto point for deep penetration. This hefty piece of steel has heat-treated black oxidized bead blast finish for a non-reflective appearance. The extra-long shaft is crafted of a virtually indestructible 30% fiberglass and nylon composite material and reinforced with a steel rod for extra durability. 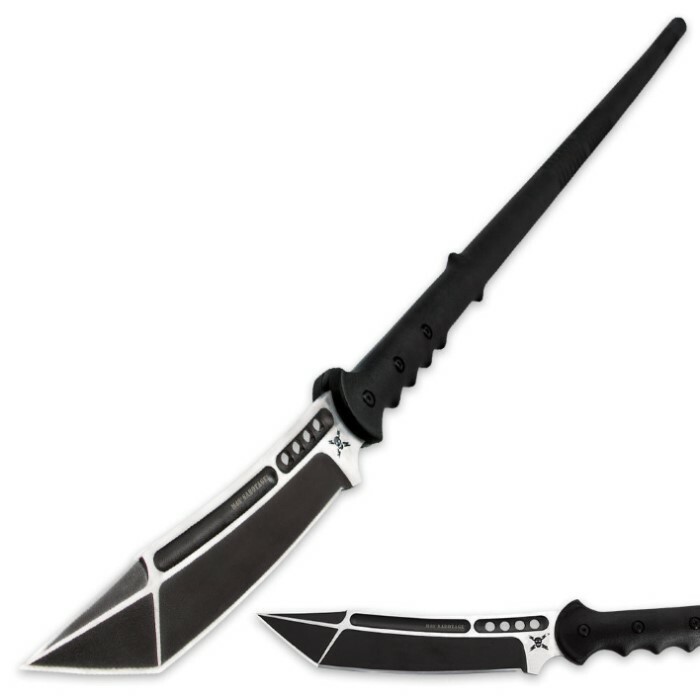 An injection-molded TPR blade sheath protects you from the sharp blade for safe storage and transportation. This thing is sharp it has good length to it and its sturdy! Definitely a good buy! I bought one of these M48 spears over a year ago and paid the same price offered on BOGO deals and satisfied with the "one" I purchased. So, "if" the quality is the same as what I bought and paid for just 1, this is a great buy. But, I've recently bought several knives and very disappointed in the quality of other products of what they are selling which seems to have gone down. But again, if the quality has remained the same, this is a great deal. My "one" I bought is solid, fairly sharp out of the box and as I did, re sharpened and stropped it to razor sharp. But in my opinion as far as sharpening a edge weapon, any stainless steel will not hold an edge very long if used as compared to an edge of high carbon steel. I could tell by the weight of the package on the porch that this was a substantial weapon. This is well built and very impressive. The way that the tang is bolted to the handle looks very sturdy. I can tell why the other M48 models get such great reviews. I chose the Sabotage since it was the most affordable (notice I didn't say cheapest) and I love tanto point blades. The blade is very substantial and came very sharp from the factory. The fiberglass & nylon shaft is the perfect medium weight-- not too heavy and very solid. Highly recommended! !